Jersey City is the second largest city in New Jersey. It’s also the seat of Hudson County and it’s located on the peninsula Bergen Neck. 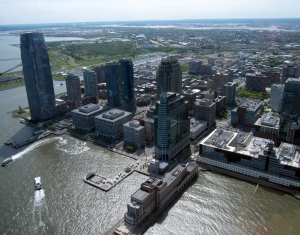 Since the housing is at very good price in Jersey City, for a certain amount of money it is more likely for you to find a decent apartment in Jersey City than in Downtown Brooklyn for example. As you can imagine, the moving costs are lower than in nearby neighborhoods, so you may be surprised how easily you can find cheap movers in Jersey City. This area is among the cheaper ones when it comes to moving and hiring movers. According to Dumbo’s records, the most of the New Jersey moves they performed within Downtown Jersey City. In fact, Dumbo’s customers state that this area is pretty affordable and safe. If you are renting the apartment, it is much more affordable than in Manhattan. However, Manhattan is just across the river, a brief PATH ride away. So, even if you are working in Manhattan or Brooklyn, moving to JC is not a bad idea, considering the amount of money you could save. The PATH train will get you to Midtown and Downtown Manhattan. Also, there is a wide range of bus lines, which make every part of the area easily accessible. The ferries can take you across the Hudson river. In case you are not comfortable with using those means of transportation, you can always get a cab at very affordable price. Downtown JC offers an amazing view of Manhattan. It is also great commercial center, home to the following institutions: Goldman Sachs, Barclays, and Price Waterhouse Coopers and cultural center which includes various historic monuments and buildings, museums, memorials,… Whether you are moving to or from Jersey City, bare in mind that the move is anything but easy. Dumbo moving and storage movers are at your disposal to help you move without major stress and headaches. Our movers will take good care of your belongings, which will be transported safe and sound to your new location. Having top-quality movers around, you can relax for a while and handle some other moving issues like paperwork. Well organized move is actually successful move, so don’t hesitate to call or visit us.